Text structure can be a struggle sometimes for students to grasp! These activities and games make practice fun and engaging. Perfect for test prep, review, or introduction of the skill. 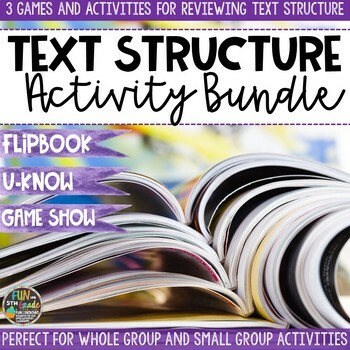 You get a text structure PowerPoint game show, Text Structure U-Know, and my BEST SELLING Text Structure Flipbook. Check out MY STORE for even more fun, themed printables! Find me on Facebook for new products, contests, and fun!Follow me on Pinterest for tons of great pins! !